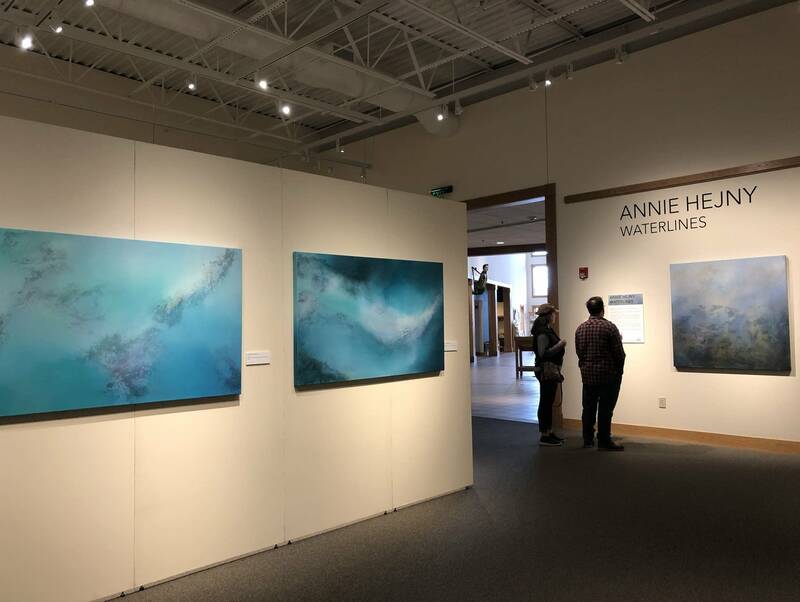 The Minnesota Marine Art Museum in Winona is known for its stellar collection of art inspired by water, but a new exhibition takes that water connection to new depths. 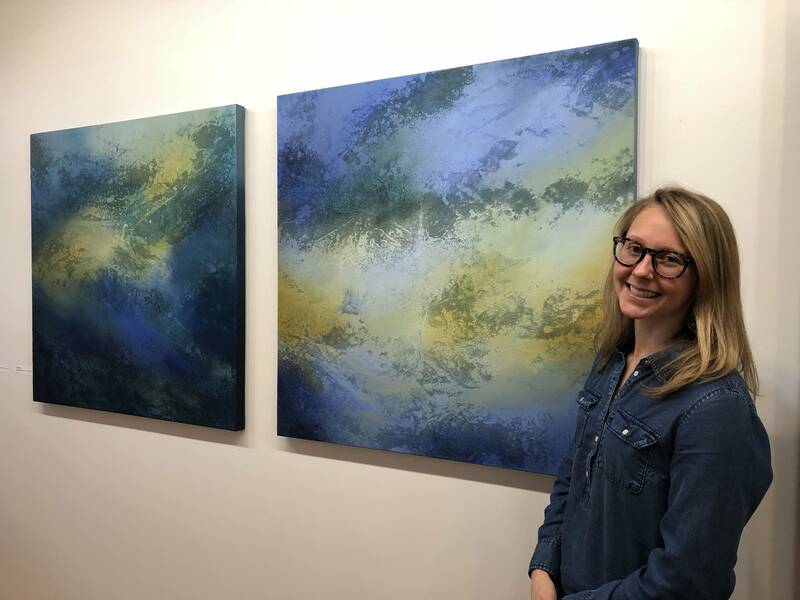 A series of richly colored abstract paintings by Twin Cities artist Annie Hejny, gathered under the title "Waterlines," are not just evocative of certain bodies of water. Curator Dave Casey explained that these paintings are actually made with them. 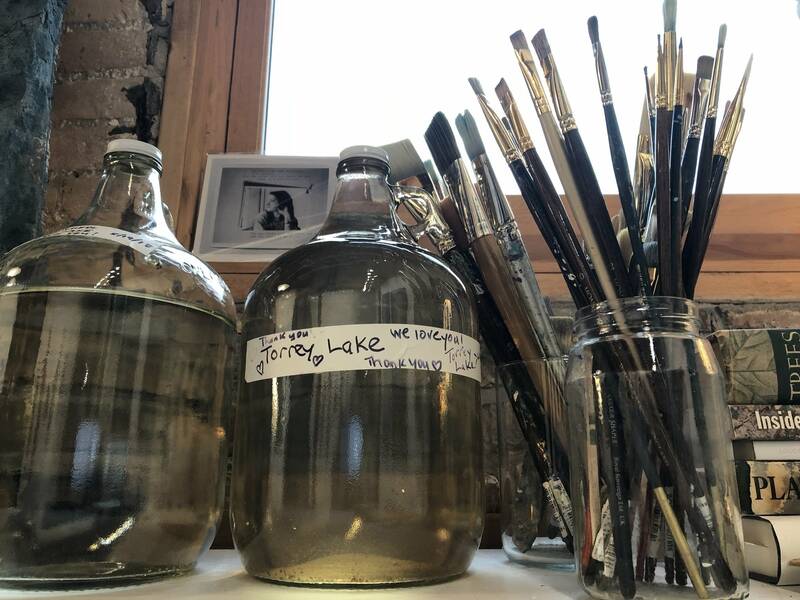 "So the water of Lake Superior and the Mississippi River and Lake Michigan and the Minnesota River — those are in these paintings," Casey said. And not just water, but sediment, too. The paintings have a texture that, combined with layers of paint, gives them an almost geographic feel. Even though the works aren't figurative paintings of a lake or a river, Casey said, you still can feel the presence of that body of water in the painting. "The final product is beautiful, but there's a huge process that goes along with this work that's just as interesting and just as beautiful as the work itself," he said. More of Annie Hejny's paintings hang on the wall of her studio in Minneapolis. 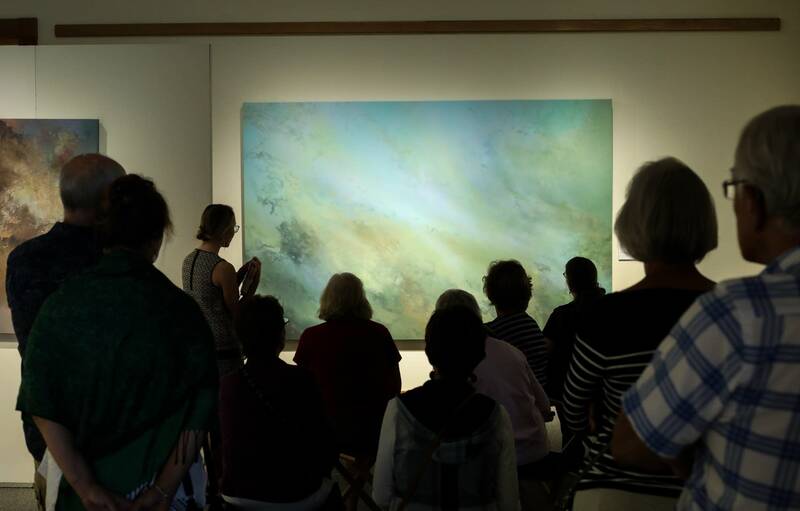 They are large, luminous works filled with rich colors and contrasts that flow across the canvas and draw in the viewer. They feature deep blues and greens with occasional bursts of yellow or rust. Shelves hold glass bottles of water labeled with the names of their sources: Coffee Lake, Torrey Lake, Minnesota River, Mississippi River. "I always like to say that my process starts at the shoreline," said Hejny. Hejny first came up with the idea of harvesting water for her paintings a few years ago. On her first attempt she grabbed a container, headed to the river, filled the container with water, and came back. Easy, but for one thing. "I didn't have honorable practices," she said. "It didn't sit well with me. I knew there needed to be something more — I needed to have a philosophy behind my practice." Then Hejny read Robin Wall Kimmerer's book "Braiding Sweetgrass." Kimmerer is a professor of environmental biology and an enrolled member of the Citizen Potawatomi Nation. In her book, Kimmerer talks about the "honorable harvest." "Know the ways of the ones who take care of you — so you may take care of them," Hejny read from the book. "Introduce yourself. Be accountable as the one who comes asking for life. Ask permission before taking, abide by the answer. Never take the first, never take the last." Hejny incorporated those ideas into her harvesting practice. As she approaches a lake or a river, she reflects on her intentions. She notices the light, and the colors along the shoreline. Hejny often leaves a gift in exchange for what she's taken — dried flower petals. She then takes the water and sediment back to her studio and creates. She hopes her work inspires people to think about their relationships with nature. And she hopes they'll begin to pay more attention to issues affecting drinking water and water quality. "And I also hope that these paintings are a way of giving back, showing respect," she said. "Telling the earth and the water, 'Here's something beautiful that honors you.' So this is my language for showing that." "Waterlines" runs through Jan. 6 at the Minnesota Marine Art Museum in Winona.